The coxwain of the Cromarty Lifeboat was Albert Watson and the Engineer was John Watson. The website mentioned by Wybe contains photos of the Lilla Marras Douglas and Will as she is now, including interior shots showing the luxury fittings including a wooden 2 person bath! Another view of the lifeboat can be seen in picture #163. I suppose this lifeboat is the Lilla Marras. Today she is serving as a luxury, floating hotel-suite in Harlingen (the Netherlands). This is actually a reserve boat (probably the RNLB John Russell) which was stationed at Cromarty on several occasions when the James McPhee was at Buckie for servicing. Clem I think this reserve lifeboat could be either "RNLB W and S" or "RNLB Julia Park Barry of Glasgow" or "RNLB City of Edinburgh" or "RNLB City of Bradford11" - certainly one of that class and the picture I am sure is taken about late 60's when orange paint was first used. I would be very interested to know exactly which boat it is as I know the owners of the first and last one very well. Could you check the station records? 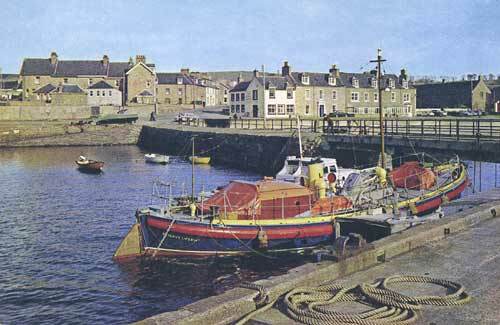 Clem Why doesnt Cromarty still have a lifeboat - isn't it just as necessary now as it always was? I remember how many brave rescues she made and I cannot understand why it has been deemed not needed. Please can you enlighten me? Mary, The situation back in 1970 was that my father was coming up to retirement as Coxswain, and there was a decline in shipping and fishing in the Inner Moray Firth, coupled with a decline in the Cromarty 'seafaring age' population, there was no potential crew available. After a coastal review by the RNLI it was decided to close the Cromarty Station. Then with the arrival of the'North Sea Oil' effect, bringing a resurgence in coastal shipping back into the Cromarty Firth/Moray Firth area in 1972, it was decided by RNLI HQ to re-establish the Station at Invergordon in 1974, where it still is today. entrance to Inverness Harbour, and the Caledonian Canal. Thank you Clem for the info. Yes of course I can see what you mean and fully understand the logic behind it. I well remember the day the Lilla Maurice Douglas and Will was named it was a great day even for us kids. In my humble opinion I think its a shame that she had to go I've seen her as a Hotel Suite and grand as it is I dont think its a fitting end to such a grand old girl - just my feelings for what its worth. Clem i have come accross a postcard of this very picture and the writing on the stbd aft side is clearer than this one and it says Cromarty Lifeboat. I'm just wondering would a relief boat say Cromarty Lifeboat on it? The PC displayed is unclear, but you are correct the reserve lifeboat would certainly Not have the words Cromarty Lifeboat on the stern. I've looked at the stern of this PC again and even checking the number of letter impressions, I can't pick out CROMARTY. I certainly remember this PC when produced and it had Reserve clearly written . We'll swap notes next time I'm down in Cromarty. This is certainly a 45ft 6in Watson. I am almost certain she is marked "Reserve Lifeboat" but it's not easy to tell from the pic. If she is marked Cromarty Lifeboat then she must be the James McFee which was station boat at Cromerty from 1928 to 1955. If she is marked Reserve Lifeboat she isn't the City of Bradford as that boat was unique in having a frame built over the windscreen arrangement in front of the cockpit; the frame was used to drape a canvas sheet over for added protection for the crew, fitted when she was still station boat at Humber. She isn't the Julia Park Barry of Glasgow or the City of Edinburgh as they were of the later 46ft 0in Watson design which had a modified 3-piece windscreen and funnel. Given the list provided by Quinton it therefore seems likely that she is the W&S which was a Reserve boat from 1960 until being sold out around 1968-69. She is now a yacht. Hi Graeme the site is very active. If you want any info on the boat speak to Clem Watson as his father was Coxwain of her. He can be contacted through this site also Arthur Bird who submitted this picture can also be contacted through this site. Dear Clem Watson (what is the forename of your father who was Coxswain? )and Arthur Bird who submitted this picture. As mentioned I am writing abook about the long history of W&S. I have all the service records and personal recollections from 30 years at Penlee and at several Scottish stations including Cromarty.The boat is now being restored in Harwich by ex-LOM Capt Rod Shaw and we aim to publish during her 90th anniversay year in association with Penlee Lifeboat. "From July 1963 until November, 1964 she was stationed at Cromarty, with one launch on July25 (R928) and no lives saved. [The Cromarty station, opened in 1911, was closed down in 1968, and later replaced by the nearby Invergordon station which opened in 1974.]" I would be grateful if you could shed any light on that shout and any other points of interest during her time with you. Could you also supply a photo of the stations's service board showing that service? Any info of any sort would be appreciated and credit given in the final book. Hi Graeme. Albert Watson was Coxwain of the Lifeboat here and his brother was engineer. The Lifeboat boards are in the East Church and if there isn't pics of them on this site I will get some for you. If you type Lifeboat in the search box you will find plenty of pictures of the Cromarty Lifeboats. I have a picture of W&S at the ferry berth in Cromarty Harbour I will look it out for you. The Lilla Marras was a Watson Cabin 45ft? class with a later enclosed cabin similar to the larger Barnet 54ft class. As a matter of interest I think Albert's Endeavour was built in Larch by some Watson family members'. The Endeavour was built in Burma of triple diagonal skin Teak for the Admiralty as a Liberty rowing boat. Used by one of the Dreadnoughts maybe even the Natal! The Lilla Marras, Douglas and Will was a 46ft 9jn Watson, the 45ft motor powered Watsons were a very different design dating from the 1920s. The Barnett class was a larger version of the 46ft 9in Watson at 52ft rather than 54ft. Am afraid I made a typing error with the last comment.The Enterprise was built of Larch. If I remember correctly (which is difficult)construction was undertaken just east of the slaughter house where the sailing/rowing fishing boats were beached. Dennis I was told that Enterprise was built at the factory Buildings in Marine Terrace.